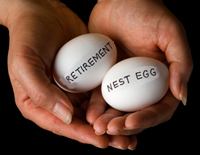 If your company doesn’t have a retirement plan, then you should start an IRA or a ROTH IRA. An IRA account is for saving pre-tax money to be able to withdraw later in life when your tax rate should be lower. A ROTH IRA is the opposite. You contribute after tax money now and withdraw tax free at retirement. Talk with your investment person or tax preparer to determine what is best for you. Discuss the income limits and the maximum contribution amounts you can contribute based on your age. Have this discussion today. I can hear you saying… “I don’t have enough money to live today, so how can I think about saving for retirement?” Yes, that might be true, but look at it another way… you will get older and you will want to retire some day. If you don’t start now you’ll have to work the rest of your life. If you work for a company that offers a 401K or 403B, take advantage of it. If your company offers you matching funds and you haven’t taken advantage of it, then you are turning down FREE money. As an added benefit, the money you contribute is tax free today, and any growth in your account is not taxed until you withdraw it. Talk to your company benefits person and start an account as soon as possible. If you need to wait for open enrollment, mark that date in your calendar. If you already have a retirement savings with your company, increase the amount you contribute so you’ll have more later when you really need it. Will you have enough money to live the lifestyle you want when you retire? That’s a hard question for most people to answer I usually hear that I don’t have enough money to live today, so how can I possibly save for my future? Let me start by giving you some history of how retirements worked When our parents were working, they worked for one company their entire career For that loyalty, the company took care of them in their retirement Once your parents retired, they would collect a monthly pension from the company for the rest of their lives That, with the added benefit of social security, paid for their life style. Then companies changed and 401K’s and 403B’s were introduced These are savings plans that are offered and sponsored by the company you work for You, as the employee would designate a portion of your income to go into this account pre tax and the company would match a certain percentage An example of this would be for each dollar the employee put into the account, the company would match that at a percentage up to a maximum amount Companies have almost eliminated the pension in favor of this savings plan. This has altered your retirement and your financial future, along with the fact that employees don’t typically stay with one company for the entire career Instead of being set with a pension, you now have to be proactive and plan for your own retirement. If you want to live the lifestyle that you are accustomed to, you have to do two things prior to retirement First, you need to save for your future by making funding your retirement a priority You need to find the money to be able to save for your future Second, you need to enter into retirement with minimal of no debt Someone who is living in a home that has no mortgage and has no other debt (car payment, credit cards etc), will need far less money per month, than someone who does. Bottom line, you need to find the money today to save for tomorrow.